Returning to Colorado was a new sensation for me. It was very different from returning after a vacation or even after our 2-month sabbatical. Sure, the sights are all familiar, but the feeling is different in a way that’s hard to explain. Just knowing that we’ll be leaving again soon puts a distinct emotional spin on the experience. We left frigid Virginia for balmy Colorado: not exactly what we’d pictured when we were booking the flights. So frigid on this side of the country, in fact, that the night before we left we had to forego a shower in our moderately fancy Airbnb because of frozen pipes. Don’t pity us: we received a full refund which we plan to spend on a Valentines Day getaway to our closest National Park: Shenandoah. But gracious reimbursement aside, we were delighted to leave highs in the 20’s behind for Denver’s sunny 50’s on the day we landed. Back in a place with acceptable public transit and a robust Uber and Lyft fleet, we used those resources to start our Back to Colorado Tour. The first stop was at Africa Direct: the outfit that employed me and built my entrepreneurial interests over the last five years. It was a pleasure to drop in and find the business plugging along post holiday-rush. Contrary to popular belief, quitting a job doesn’t necessarily involve animus or resentment. I am grateful to have had an employer all those years that encouraged and fostered my personal passions, even past the point that they diverged with the interests of the company. I think that’s the point at which your boss crosses over into the category of friend, and that’s a transition that should be recognized and treasured. After our brief visit at the ol’ office, we headed downtown for brunch with nearly a dozen friends where somewhat crude gifts were exchanged and many stories were shared. It was refreshing to be back in the presence of known people, as the making of friends in Virginia has been a slow process. We’ve spent a lot of time with colleagues, baby boomers, and baby boomer colleagues since those folks make up a lot of the non-profit pool in these parts. I don’t have an explicit gripe with the most aged part of our population. In fact I find the availability of their generational wisdom advantageous as I seek to establish this farming business. But it’s invigorating to sit with people who you know and who know you after doing so much introducing of ones self. After brunch we headed to Colorado Springs for a late Christmas celebration and the following day we whipped up a big home cooked meal over which to host a slew of friends and family that evening. It was difficult for me to make sure that I invited everyone I wanted to join us for dinner that night. And I know that I missed a few and I’m sorry for that. But the crowd that came out for our Thursday night dinner party was a real delight. We chowed on ribs, chili, and delicious mac and cheese. We downed a few local brews to celebrate Colorado, and we played a tremendous game of Writesy-Drawsey before calling it a night at the responsible time of 9:30pm. 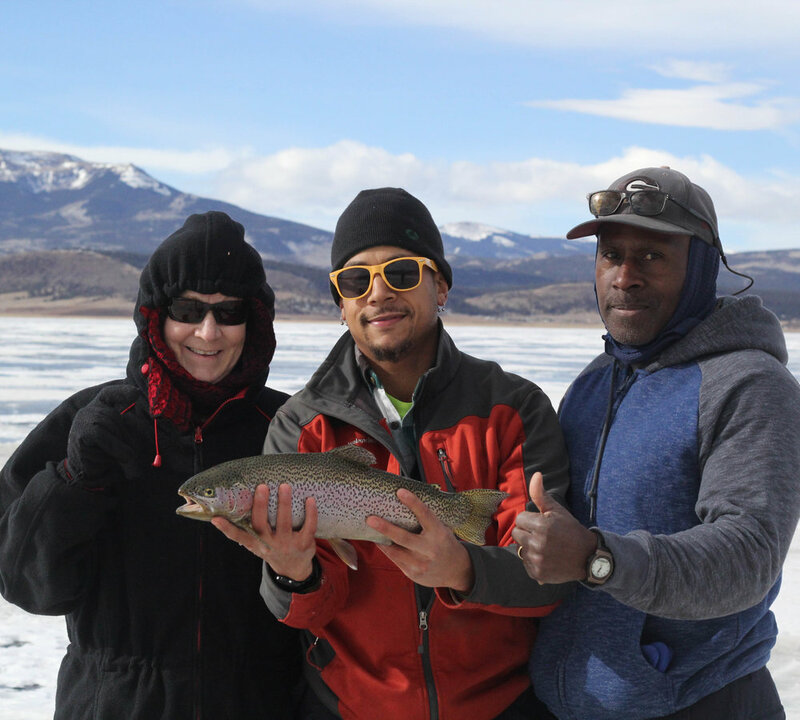 The next few days we spent in and around Gunnison: the alma mater town of my father and home of the best fishery in the state of Colorado, Blue Mesa Reservoir. The 6 of us (Mom, Dad, Chloe, brother Aaron and his lady Diana) spent the long weekend in a sequence of fish, bonfire, grill, rinse, repeat. As I mentioned in my last blog, ice fishing is among the activities I will miss the most since I’ve moved east. So spending 2+ days with my most-loved ones pursuing nothing but chunky rainbow and brown trout was pure bliss. I am so very grateful to my parents for the foresight to make this trip a priority and the finances to make it a reality. When the fishing is slow, we play football. We left Gunnison on Sunday afternoon and some car trouble not withstanding, we remained on schedule as we got back to Colorado Springs to repack for our frugal Frontier flight back to Charlotte. Weight limits forced us to leave a few of the generous gifts from late Christmas behind to be mailed later. But we got our 49.5 lb suitcase loaded up and headed to one more function in DTC on the way to the airport. We had average bar food and above average beers for a late dinner before another game of Writesy-Drawsey, this time with 30 second time limits. It’s amazing how much cruder the game can become with strictly enforced speed rules. The nine of us laughed heartily at all the sketches of phallic clouds, then Chloe and I moved our luggage from car to car for the last leg of our trip to DIA. Our flight took off just after midnight and we were on our way back home. Yes, I wrote home. Because remember, home is where you don’t have to wear pants.